For my darling hubby when he returns home from work I have prepared this spread. All made fresh, from scratch today, I have created a Lebanese culinary masterpiece (at least in my mind anyways). 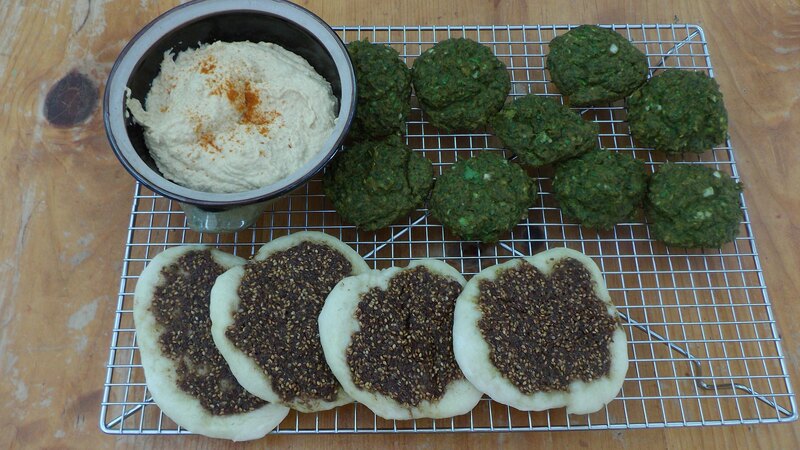 We have the pita bread with Zaatar spread cooked in the oven, hummus, and my latest adventure with falafel. All an amazing foray into Middle Eastern cuisine. Sitting on my deck in the last heat of the day, I put them all together in the pita and had a Mabel, Tabby, and Hugh moment. What will they think of all these tastes and so many spices that are new to them while they are staying and living in Petra, Jordan? Posted in Middle Eastern Cooking in my Kitchen. Previous Post Fresh from the oven….Zaatar!